Save Â£10 off your Airbox Aware or Aware+ during March and April 2011 – see below for details. My first question for William was to ask about the background and functionality of the Airbox Aware – airspace warning device. William described how they were approached by NATS and were asked to work with them on the problem of airspace infringements which had reached nearly 1000 a year. The worry was that the more airspace busts there were the more airspace restrictions would be brought in so Airbox were keen to help develop a GPS that would help prevent infringements. The unit that they developed was designed to be cheap. At the time of our interview they were priced at only Â£149 but this has risen to Â£159 at the time of release of this podcast. The Aware is really a very simple GPS with many of the unnecessary functions stripped out. It comes with the UK, CAA, half million scale aviation charts but quarter million scale UK and various other countries’ charts are also available. It was one of the key drivers for the Aware product that the airspace definitions should be up-to-date and as such, updates of these definitions will be free for Aware purchasers, as and when they are released every 28 days, for ever. This gets over the issue of people flying with GPS’s that have out of date airspace data. The unit itself has a 4.3″ screen which is extremely bright and clear so should not pose a problem when used in your well lit, sun-bathed cockpit. The charts that come supplied with the device are digitized CAA standard issue, half million scale and your position is shown by way of a small aircraft in the centre of the screen. A track line is shown which highlights where you will be in 5 minutes time. You can zoom in and out of the charts and your absolute position is indicated along the bottom of the screen which, as I’ve found, is ideal when you need to let ATC know where you are. The Aware gives you warnings of all airspace that you are at risk of infringing. It tells you the type of airspace, its height, its name and soon will even give you a radio frequency for the airspace controllers. As you approach airspace the unit gives you a visual and audible warning so you have no excuse for busting a control zone if you are using the Aware. I asked William which market the Aware was designed for. He feels that the unit is ideal for pilots that like to fly with a map and stop watch but that want a back-up to keep themselves safe. It’s also suited to those flyers of very inexpensive aircraft. Their plane may only be worth a few thousand pounds so a fully spec’d GPS may be out of the question financially. 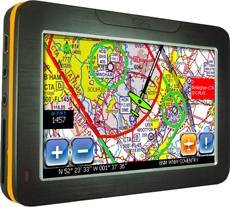 Some pilots have been known to buy an Aware as it was cheaper than buying the updates for their main GPS system. William reiterated exactly what the unit is for. The Aware offers that basic security level with ease of use at a bargain price. The beauty of the unit, William claims, is in its simplicity. In the time that the Aware has been on the market, which is approaching a year, the number of infringements has reduced for the first time since the CAA began keeping records in 2003 so, on the face of it, it does seem to be working. The CAA has even given Airbox an award for their contribution to aviation safety. If you would like to add some functionality to your basic Airbox Aware, there is a simple upgrade path. You can opt to pay Â£119 (or Â£100 at time of original purchase) and that will transform your basic Aware in to the Aware Plus. The Aware + gives the user some additional functionality such as the ability to route plan by using the unit’s touch screen. Find a location on the chart, press and hold to fly there, add and delete waypoints, load and save planned routes, etc. The unit will now also give you track and speed data whilst in flight together with ETA for your destination. Airbox do have their own, fully featured, flight planning software to enable pilots to plan their flight on a PC. 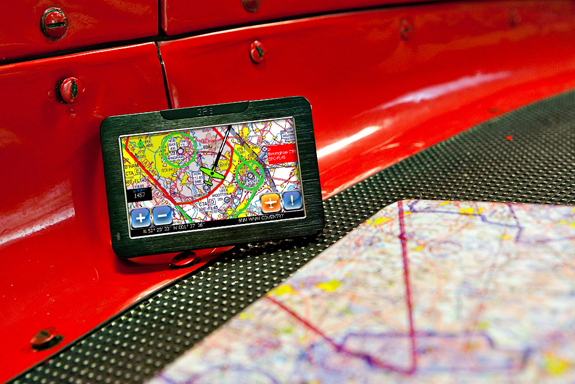 It’s called Fastplan and it’s available at Â£45 and is designed for use with your Aware Plus GPS. Fastplan allows you to plan routes from your home or office PC and transfer those routes, along with flight logs, user waypoints and other data, to and from your Airbox navigation system. Fastplan Unlimited is available for Â£149 for 1 year and includes all 1:500,000, 1:250,000 chart updates and weather and NOTAM subscriptions. 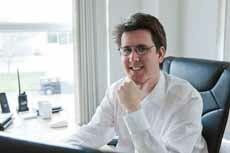 As a company, Airbox are very customer focussed. You only have to have a look at any of the main GA type aviation forums and you’ll find Airbox staff on there listening to comments and helping customers with issues and queries. So, altogether the Aware is a great contribution to aviation safety. It is made to a price and is designed to be simple to use and operate but having said that I think that it’s a ‘must have’ for any keen aviator that wants to remain outside controlled airspace. I know fellow flyers that have it just as a back up alongside their main GPS or use it as their sole GPS unit when they are flying with map and compass. Either way it’s a great piece of kit and excellent value at Â£159. For those of you looking to buy an Aware or an Aware Plus GPS during March and April 2011 you can save another Â£10. Airbox are extending this offer but only to include the first 50 units bought and the offer must end at the end of April 2011. Just call Airbox direct on: 01235 227250 and mention that you heard about the Aware on Flying Podcast. This entry was posted in All Podcast Episodes, Equipment and tagged Airbox, Aware, General Aviation, GPS, Podcast, podcasts by admin. Bookmark the permalink. A great idea, Steve. I was thinking about buying an Aware and this convinced me to do it. Do more like this!